Dr. Martin Schwarz EXPERT 20% is a gel product intended for whitening at home using mouth tray method, based on the dentist’s guidelines or used for whitening treatment in dental offices and cosmetic salons. The whitening effects of Dr. Martin Schwarz EXPERT 20% are based on oxidizing organic pigments found in products such as wine, tea, coffee, tetracyclines, etc. The selective degradation of substances using Dr. Martin Schwarz EXPERT 20% makes it possible to get rid of undesirable tooth discolorations. Specialists from Dr. Martin Schwarz, in cooperation with dental clinics, created the unique formula of Dr. Martin Schwarz EXPERT 20%, characterized by strong whitening properties. Dr. Martin Schwarz EXPERT 20% gel is also free of a series of side effects which can occur when using other products. The formula of Dr. Martin Schwarz Expert 20% makes it possible to achieve white teeth without the necessity of applying additional equipment and lamps increasing the risk of thermal damage to the tooth enamel. Dr. Martin Schwarz EXPERT 20%, thanks to the right proportions of water, moisturizing components and active auxiliary substances, also counteracts the drying out of teeth. Applying precisely selected concentrations of potassium, glycerol and carbamide released during the whitening process reduces post-treatment tooth sensitivity, which is moderate and occurs only sporadically. The combined effects of these substances in many cases completely eliminate post-treatment tooth sensitivity. Tooth discoloration is a frequently occurring symptom of fluorosis – an illness caused by excessive amounts of fluoride ions absorbed by an organism. Fluoride is a microelement which improves the condition of the enamel, but, in excess, can lead to adverse health effects. Due to the fact that Dr. Martin Schwarz EXPERT 20% does not contain fluoride, whitening treatment does not increase the risk of the occurrence of fluorosis. Dr. Martin Schwarz EXPERT 20% whitening gel prevents acid-induced demineralization of tooth enamel which is observed during treatment using products with a pH lower than 7. 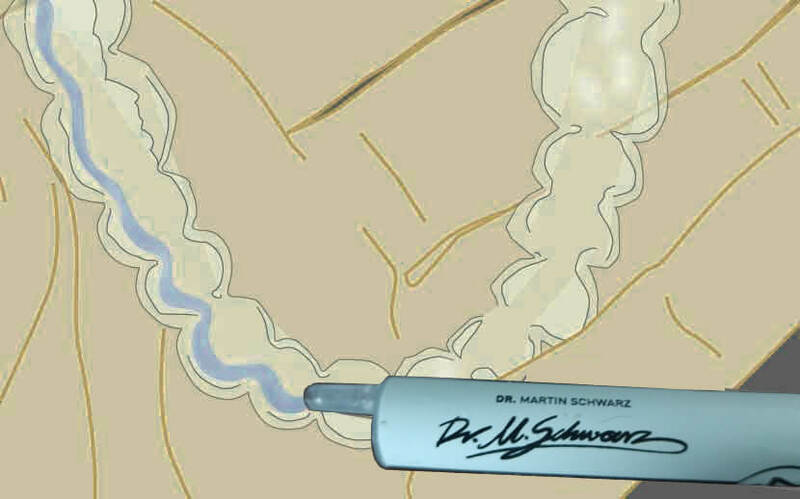 The effect of enamel demineralization in the case of applying gel Dr. Martin Schwarz does not occur. Brush and dry your teeth just prior to whitening treatment. The whitening gel is the most effective when the teeth are clean and dry. The same applies to dental trays, which will be placed on the teeth. Remember that the best whitening effects are ensured by using custom made dental trays – precise impression of the teeth shape. Dry custom made dental trays / thermoforming mouth trays might also be considered. 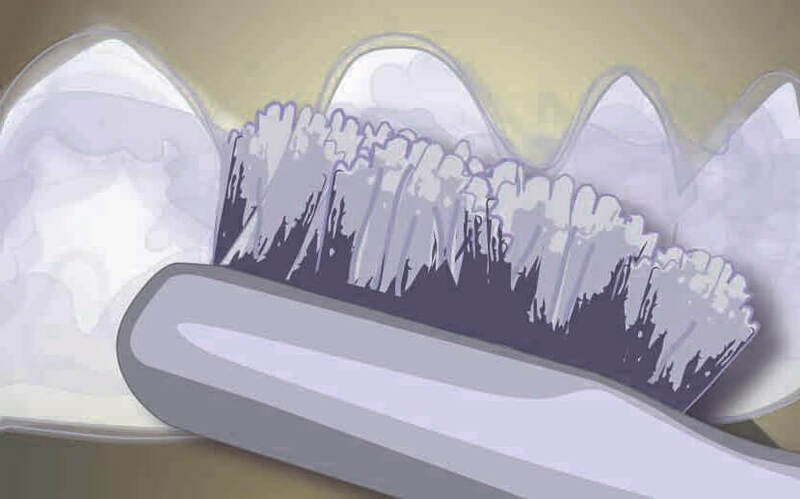 Place a small amount of gel on the front surface of the inner part of dental trays ( the gel should cover external surface of teeth). Apply the gel on each tooth to be whiten. 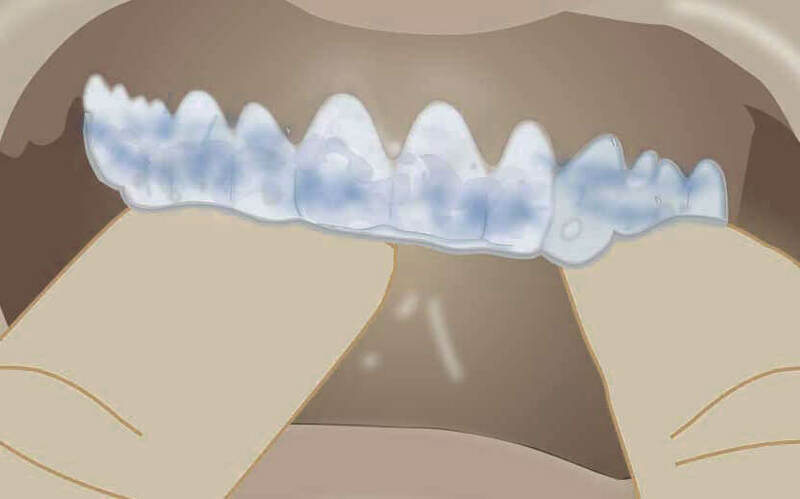 Amount of the gel should be small enough so after inserting trays into mouth, the gel would not overflow on gums, but in the same time would cover the surface of teeth desired to be whiten. The estimated amount of gel for each arch is: 0.1-0.5ml. About 0.1 – 0.5ml of gel for each arch. Cover inner front surface of a tray. Gel shouldn’t overflow on gums. Apply dental trays with Expert 38% on your teeth and keep it for 20-30 min. If the gel overflows from the trays on gums, remove it from the skin with a finger, tissue or a cotton swab. Remember that during the whitening process you can not eat, drink or smoke cigarettes. Remove gel from the skin. Rinse off your mouth with water. Clean dental trays with a toothbrush & toothpaste. Store in a tray holder.